Lately I have been seeing a lot of recipes for spiralizers on Pinterest. I usually just scroll right past them since I don’t have one (sad face). At first I thought I might have to miss out on all those veggie noodles. But I remembered I once made a recipe with zucchini noodles; before the trend of spiralizing your veggies was popular. It was in an old Fitness Rx For Women magazine. So I started doing some digging and there it was, in my June 2012 issue. 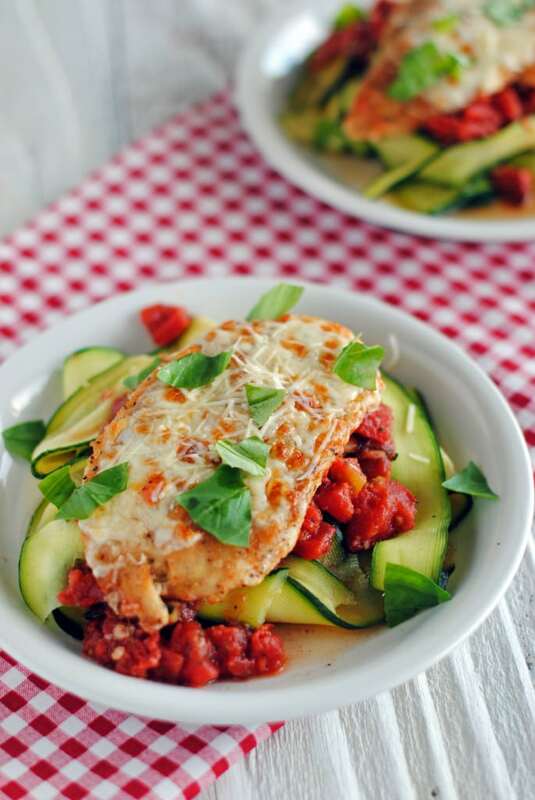 I put it on the meal plan as fast as I could and viola, lightened up Chicken Parmesan with Zucchini Noodles was on my plate. No spiralizer needed! I do recommend a good vegetable peeler to make peeling the zucchini a breeze. I like the Titan vegetable peeler . I’ve had mine for about 2 or 3 years now and it’s just as sharp as the first day I used it. I once used my old vegetable peeler since my Titan was in the dishwasher, never again. I got my Titan out of the dishwasher and life was simple again. In a shallow bowl, combine the flour with 1 teaspoon each of dried basil, dried oregano and garlic powder. Salt and pepper chicken on both sides and dredge the chicken in the flour mixture coating each side. Heat oil in large oven proof skillet on medium-high heat. Brown chicken breast on each side, 3-4 minutes per side. Remove chicken and set aside. Add zucchini strips and 1/3 cup water to the skillet. Cover with a lid to steam for 1 to 2 minutes. 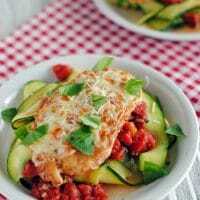 Remove zucchini and set aside. Drain excess water if needed. Add diced tomatoes, remaining seasonings and chicken to the skillet and mix to combine. 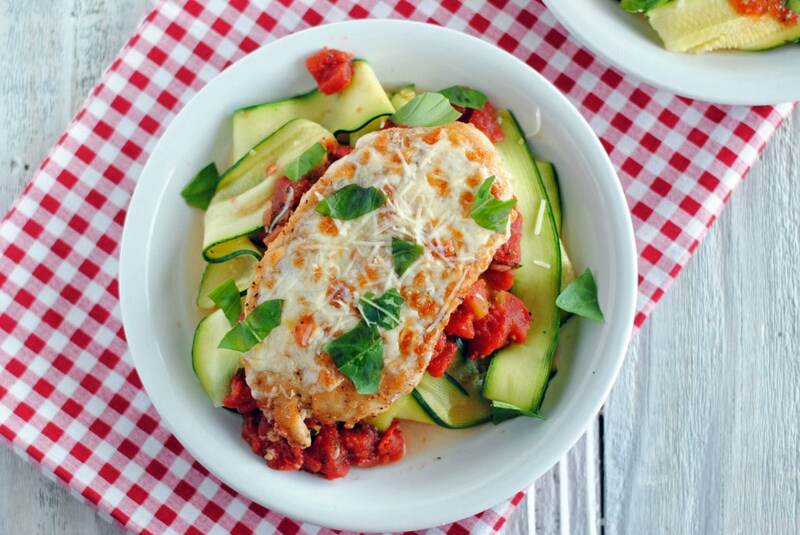 Add 2 tablespoons mozzarella and 1 tablespoons Parmesan cheese to each chicken breast. Stick under a broiler until the cheese has melted and is nicely browned. 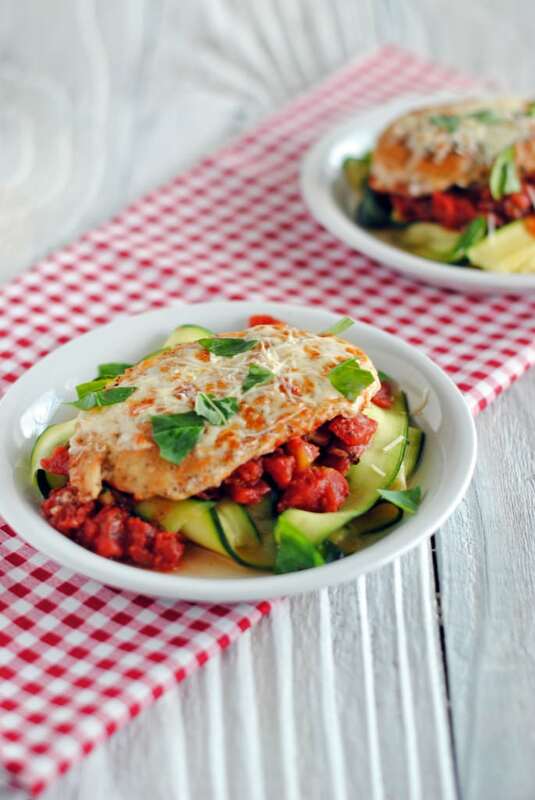 Place zucchini on a plate and top with chicken and tomato sauce.